Wastes an excellent setup on a dull romance between two people who have absolutely no onscreen chemistry. 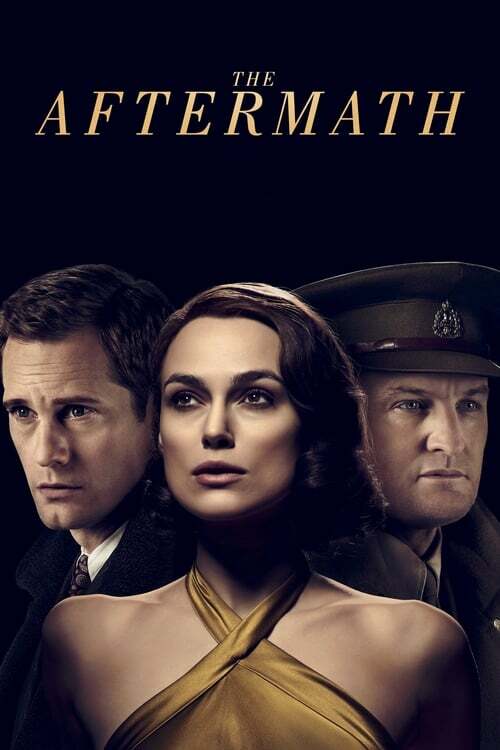 Based on Rhidian Brook’s 2013’s novel of the same name, The Aftermath is a romantic drama about a British Colonel’s wife having an affair with a German widower in postwar Germany. And that’s pretty much it. Honestly, if you’ve seen the trailer, you’ve seen the film because that’s all there is. Despite its fantastic setup and interesting snippets showing the British military rebuilding a destroyed Hamburg, this film misses a great opportunity to explore engaging themes revolving around the German people’s suffering after World War II and instead focuses on an unrealistic relationship between two people who have no onscreen chemistry for 104 interminable minutes. This story has no surprises, no twists and no decent payoff at the end. Directed by James Kent (Testament of Youth, The Thirteenth Tale), The Aftermath starts with Rachael Morgan (Keira Knightley) taking a train to Hamburg to live with her husband Lewis Morgan (Jason Clarke), a Colonel in the British Military assigned to the task of helping rebuild Hamburg now that the war is over. The luxurious new home they are to live in during the rebuilding process has been requisitioned by the military from Stephen Lubert (Alexander Skarsgard), a widower who lives with his daughter Freda Lubert (Flora Thiemann). Once the Morgans have settled in, however, Stephen and Freda were expected to be evicted from their home and sent to live in a local camp. Sensing their discomfort, Lewis has a kind heart and realizes the house is large enough to accommodate both families, allowing Stephen and Freda to stay in the comfort of their home instead of having them adapt to the camp’s harsher conditions. Stephen is grateful at being allowed to stay – even in a separate “zone” of the house. His decision doesn’t sit well with Rachael, who had hoped to live privately with her husband after being separated for so long. As time passes, Lewis and Rachael try to rekindle their relationship, though Lewis’s military duties as well as the tension Rachael feels at having to share the house with the German owners and German house servants ends up making matters worse. Lewis is unable to give Rachael the emotional support she needs and is regularly pulled away for work purposes. After regularly being treated like dirt by Rachael and her British friends, Stephen reaches breaking point and loses his temper with her resulting in their first kiss. It’s not long after this that their affair starts, and quickly becomes a dragged out, forced love story that tries to be emotionally engaging as we watch these two give in to passion behind the back of a military husband doing his best to fix the city. Despite the boring story the acting is mostly good, though Keira Knightley is the weakest link, giving an average performance for a role that would have suited a stronger actress such as Kate Winslet or Rachel Weisz. She starts off well as a judgemental, fish out of water wife, but quickly becomes quite bland and unconvincing as a woman battling a myriad of internal struggles. While the story gives the character of Rachael Morgan little more to do other than hang around the house, attend social events – and hook up with Stephen Lubert – there is still some depth there as she struggles with feelings of loneliness and the loss of a child. Knightley simply doesn’t convey this tortured soul convincingly. It doesn’t help that the chemistry between her and Skarsgard is non-existent, which makes her journey for connecting with someone other than her husband all the more unconvincing. Alexander Skarsgard gives a fine performance as a father trying to make the best of a poor situation and you really feel the struggle of Stephen Lubert as he puts on a strong face to the world while internally dealing with the loss of his wife and life in general. He constantly suffers during the British occupancy yet puts on that fake smile and grace for the sake of his daughter. Right up until his affair with Rachel it’s easy to feel his resentment and suffering build as he reaches the tipping point. Unfortunately, that tipping point is his affair with Rachael, and all the support you have for his character quickly dissipates as he becomes nothing more than a high school boy trying to score with the stuck-up cheerleader. The performance that shines most is given by Jason Clarke, who steals nearly every scene he’s in as a military officer whose seen and suffered through much pain and anguish. He’s helped in part by being the most interesting character of the story as well as having something of significance to do. At first he appears a man far too dedicated to his job and intent on rebuilding Hamburg but in truth he’s using his devotion to work as a means of avoiding dealing with the loss of his son. He wants his wife to be happy, but doesn’t have the means to provide this so he puts everything he can into his work. It’s hard not to feel for him (not just because his wife is cheating on him) because, despite neglecting his wife’s emotional needs, he tries his best to be a good person by helping those in need. His journey is the story that would have made a far more enjoyable experience. Director James Kent has failed to deliver a film that is genuinely engaging, entertaining or even plausible. I really wanted to walk out of the cinema to be honest. There are so many teases of a more interesting film, like Freda hooking up with a Nazi sympathizer or Lewis attempting to bring order to the city and encountering the dark elements of an underground resistance – yet nothing substantial really comes of these side tidbits. We’re always being teased that something more interesting is brewing just behind the scenes, other than the main affair, but in the end these tantalizing bits never add up to much. Overall, The Aftermatch left me very unimpressed and was relieved when it was over. I didn’t care about the two lovers or their story as their entire relationship is built around physical attraction. They never really talk about anything that would make us believe there was any deep connection between them or would warrant the central adultery. I simply didn’t believe them. There’s also the little setups that never go anywhere, to the point my initial disappointment turned into frustration at the wasted opportunity. I don’t know why someone thought this story was worth telling to be honest. There are much better movies to spend your money – and time – on.